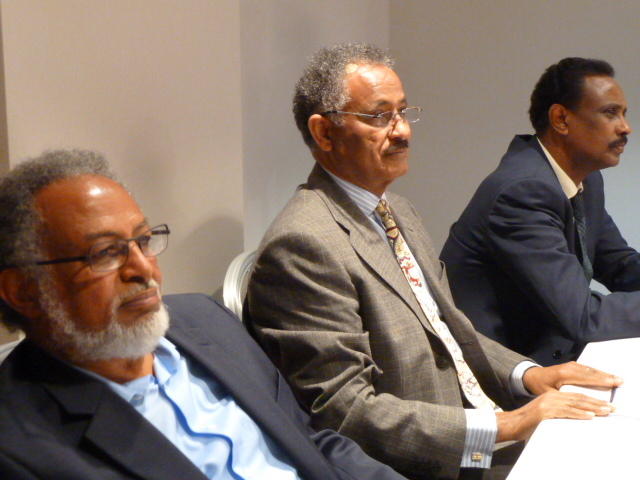 On Sunday, 2nd February 2014, the Forum was launched by Eritrean leaders in London. 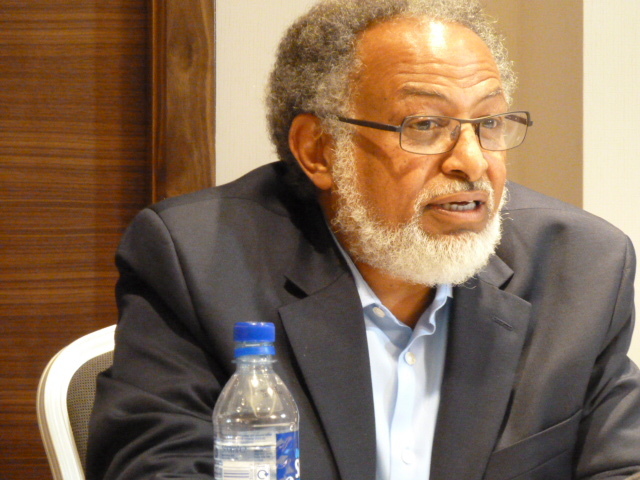 The event was addressed by Dr Assefaw Tekeste, a public health specialist and former head of the EPLF Health Department during the liberation struggle and Adam Abdela, former Eritrean ambassador to Sudan. 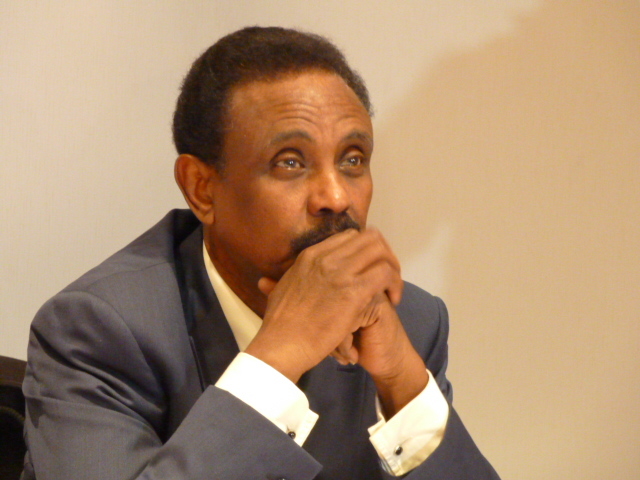 The meeting was chaired by Andebrhan Welde Giorgis, former Eritrean ambassador to Brussels. So what role might President Isaias Afeworki have in any transformation, the panel was asked. “He cannot be any part of any renewal. He must be neutralised.” declared Andebrhan. The former ambassador continued: “All attempts at change have been met with brutal repression, so the president cannot be part of any change agenda. We cannot dialogue with him,” said Andebrhan. Several Eritreans at the launch pointed out that the EPLF had an intolerant tradition, which swept aside all other strands of thinking. Adam confirmed this was true, but said the members of the Forum represented change. “We are EPLF legacy – we represent that legacy. But now we take a different approach,” he said. “We want to encourage a culture of dialogue.” The former ambassador to Sudan explained that he had been in the movement all his life, but that it had encouraged what he called a ‘deformed culture.’ “I am a changed man today,” he declared. On relations with the region, and with Ethiopia in particular, the speakers made plain their insistence that Eritrea should govern its own affairs. “We want good relations with our neighbours, based on multual recognition and non-interference in each other’s affairs,” said Andebrhan. The Eritrean people are denied the right to constitute a government of their choice and to live in peace, freedom, dignity and justice. The rise of an authoritarian dictatorship has concentrated all decision making in the person of the president of the country. The Transitional National Assembly, established by the then Eritrean People’s Liberation Front (EPLF) in 1993 to serve as the transitional legislative body until the conduct of elections on the basis of a democratically ratified national constitution within an interim period of four years, has been dismissed; the constitution, ratified in 1997 under the auspices of the EPLF’s successor, the then ruling People’s Front for Democracy and Justice (PFDJ), has been shelved aside. The organs and institutions of the PFDJ have, for all practical purposes, been non-existent for more than a decade. The president thus wields absolute power and rules the country without any legal or institutional constraints. The country’s economy, dictated and controlled by the president through cronies personally responsible to him, has come to a standstill and turned into a coupon economy where life has become unbearable for the population most of whom depend on remittances from relatives abroad. The country exists in a state of “perpetual war”, where all citizens from 18 to 70s years of age are forcibly armed. Their lives directly controlled by the government, hundreds of young Eritreans are escaping the country daily, and although some have found refuge, many are exposed to tremendous hardships including human trafficking. So many civilians languish in prisons inside the country without the semblance of any trial. Eritreans are increasingly challenging the unacceptable conditions of the country and people, and organized opposition now exists both inside and outside the country. The recent incident where units of the army, the only existing organised institution in the country, used force to publicly transmit their demands for a constitutional government and the release of all political prisoners is a telling example of how far the opposition to the regime has gone. Repression has become absolute and opposition is growing. Open political expression and organization inside the country are virtually impossible. No institutional mechanisms for transition to a democratic order exist. Under the circumstances, there is growing concern that, while change is inevitable and the situation is ripe for it, there is a danger of political implosion. Thus timely engagement is necessary to manage change and avoid chaos and undue bloodshed. To this end, a group of Eritrean personalities have established the Forum for National Dialogue to serve as a catalyst for pro-democracy Eritreans to work together to bring about organised, peaceful political change in Eritrea. To work as a catalyst in bringing together pro-democracy Eritreans inside and outside the country to replace the current dictatorship in Eritrea by an equitable governance structure based on a constitution that guarantees equal rights of all citizens, their democratic freedoms and human rights, equal access to social services, and equal opportunities to develop themselves and their country. 1) Eritrea is under an absolute dictatorship, and there is paramount need for a transition to democracy to save the people and the country from continued suffering and ruin. 2) Every possible effort must be made to bring about change through peaceful means. 3) The objective conditions for change are in place, but within the existing police state, extreme restrictions exist to public expression and organizing inside the country; there is thus urgent need to use the relative freedom outside to help the ongoing underground organizing and preparation inside. 4) The current president is responsible for the existing dictatorship and the damage it has done the country and people; he can hardly thus be expected to be part of the change. 5) Higher and middle military brass and other existing government officials willing to participate in the reform process could be part of this change. To save the country and people, all those who support change to a democratic order should be welcome. 6) We believe change will come from inside the country, led by people from inside who are committed for this change, and we are convinced such dedicated people exist. We are cognizant however, that to succeed quickly and without undue bloodshed, the internal effort requires the support of Eritreans abroad, organized as parties or as individuals, as well as the international community. Needless to say, we reject any external force to directly engage to effect change in Eritrea. 7) We have established the Forum for National Dialogue to act as a catalyst to accelerate change; to help define a minimum common program for change among Eritrean opponents of the existing dictatorship; to serve as a link of pro-change Eritreans abroad and inside; to act as an advocate in the international community of the country and people including those fighting for democracy, as well as propagate the need for change without undue bloodshed. Eritrea needs to establish good neighbourly relations with all countries on the basis of non-interference and cooperation for mutual benefit. 8) To accelerate common development and stable peace, there is need for close cooperation in the IGAD region that would lead to regional integration. 9) To get out of the no-war-no-peace situation and ensure stable peace between the two countries, there is need for Ethiopia to unconditionally implement the decisions of the Eritrea-Ethiopia Boundary Commission and for Eritrea and Ethiopia to abide by the decisions of the Eritrea-Ethiopia Claims Commission, to immediately stop all reciprocal hostile acts, and normalize bilateral relations. 1) The promulgation of a national constitution with the above mentioned freedoms. 2) The establishment of a national body of representatives elected by the people to pass laws and supervise government on their behalf. 3) The election of a government through universal suffrage. 1) The formation of a broad based “National Salvation Council” composed of representatives from all bodies and social groups that support change as described above. 2) The formation of a transitional administration that will work for the implementation of the above agenda. 3) The transition to a democratic system of government with a duly codified social compact that binds the people and the government. 1) Operationalise the Forum for National Dialogue (FND). 2) Form and operationalise task forces, as necessary, to expedite the work and pursue the objectives of the FND. 3) Propagate for the wide acceptance of the objective, political agenda and strategy above as a minimum program of all pro-change elements of the country. 4) Work as a link between those who support and work for change inside and outside Eritrea. 5) Work to gain regional and international support for the change agenda and efforts in Eritrea. Inviting journalists and Eritreans “Selectively” the solution is not going to come from selected group but from collective group ,invite all Eritreans be it pro government or anti government , I would go as far as even inviting the the Eritrean UK Ambassador regardless weather he attends or not. Do you want it to work or not? I guess not. Why would some one make the criminal the investigator? Are we already compromising into power sharing? I I would stay away from any hgdef members unless openly denounce the dictatorial regime. Keep hope alive. I have never been so optimist ic. Power to you all. Keep the torch burning. Shet meAnTana n’Hadinetna. Where the rest of the G-13?? I believe in Inclusion than Isolation for national solution. I think they made it clear that the current dictator is not to be involved. And I believe they gave a convincing reason why that is. Your statement will stand with both legs if only Eritrean population was equal to 3 or 4 people (if you are convinced by their reason).Don’t forget they are trying to bring a solution for 4-5 million people ,you have to ask how many are supporters and how many against. I don’t mean to sound I support them (didn’t even know they existed ’till now), but I can understand when some one says they have given up trying to negotiate to change PFDJ. More importantly, the way I understood it, they are trying to fix the internal issues of Eritrean change-seeking organizations (create a dialogue within). I don’t see how one can involve parties clearly outside the opposition in that. Anyone started his discussion with a boundary mind, it’ll never brings a solution for all… it may bring a limited one. Eritrea still you have to wait till we can make a collective thinking …. THE DECISION OF THE EEBC CANNOT BE IMPLEMENTED UNILATERALLY! THIS DECISION IS IMPLEMENTED BY THE TWO PARTIES! Noble cause indeed. I liked too that Adam said he is a changed man. That’s comforting to know. Getting a Dialogue going within the change-seeking groups, including those covertly inside Eritrea (which they say exist and refer to as “colleagues”). Well, good luck! I sincerely hope getting those groups into dialogue proves easier than spotting them. As they say, better late than never. I know, We Eritreans are not pessimist to our timely real question-transition, and we’re still combating with our incredible political gift; that’s the sane full merit. Good luck our Eritran brothers and sisters, As Ethiopian and Tigraway I do hope this nation who passed though thirty years of bloody war need to ensure peace and economic liberty to its war torn people. May you all come together and save the nation from going deep to failure as a state. God bless the people of Eritrea and Ethiopia. We hope things will change for good. Бутовый камень и гравий пойдут для этого ? какие материалы еще могут понадобится? Альпийскую горку планирую строить сам.